Anthracnose on maple leaves. Photo by Joleen Stinson. 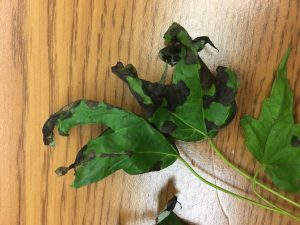 As anticipated, anthracnose is common on a number of deciduous tree species statewide this spring, especially maple and ash. Many of the maple samples we’ve seen also have tar spot. The cool, wet, humid conditions this spring were ideal for fungal leaf diseases. Anthracnose symptoms appear as patches of brown or black, dead leaf tissue which may cause leaves to curl or shrivel up as damage progresses. Trees may drop the infected leaves but will send out new leaves within a few weeks. Aspen with thin crowns caused by frost damage. Photo by Bob DeBruyckere. Damage to other species, including aspen, cottonwood and willow appears to have been caused by frost damage. These tree species likely became active and had the buds swell during the early warm up in February, then suffered damage to the buds and twigs from the cold weather thereafter. Although the damage was severe in some cases it seems that the trees produced new buds and are working on sending out additional leaves. 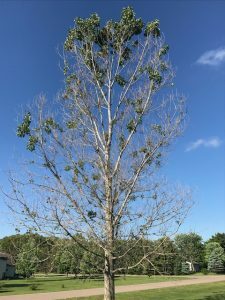 Significant dieback was noted in many locations around the state, including on some hybrid poplar in Shawano County, on trembling aspen in central and northern Oconto County, and on big toothed aspen in western Vilas County. We had reports of impacted aspen, cottonwood and willow from south central, southwest, central, west central and northcentral Wisconsin. Forest health specialists in Minnesota report similar damage. Keep impacted trees healthy by watering (where possible) during hot and dry periods to help the trees recover.